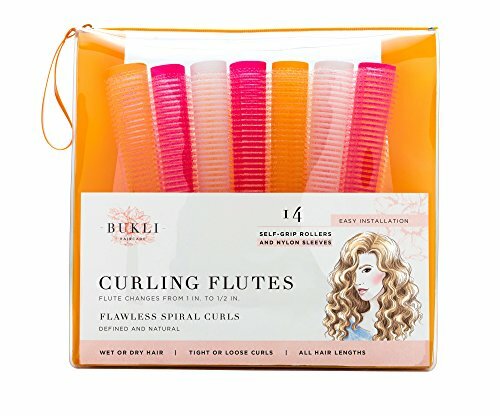 Curling Flutes, Long Self-Grip Rollers for Spiral Curls, 14 Count - Luxury Beauty Care Products ! The Curling Flutes are patent pending with the U.S. Patent and Trademark Office (USPTO). Bukli Haircare is the only manufacturer of these innovative hair rollers. The Curling Flutes let you customize your curls to the fullest. You can flat wrap the hair around the soft roller barrel for a structured spiral result; you can twist and wrap for a textured look, you can change directions, forward and backward, to achieve natural waves. The Curling Flutes set contains 21 self-grip rollers and corresponding nylon sleeves. Together they create defined spiral curls equivalent to the curls made by an electrical curling iron or a wand, but without the harmful contact with heat. The smart rollers can be easily attached to or stacked into one another to accommodate virtually every hair length and produce different hair styles including high-volume, loose or tight curls. Featherlight sleeves protect and secure the winding of hair around the rollers. Once attached to the roller the hair does not shift position even during physical activity or overnight wear. The breathable nature of both the rollers and the sleeves allows for the drying of wet hair. The flutes and the sleeves can fully withstand the use of hot styling tools on them including hairdryers and even flat irons. For Video Tutorials visit http://buklihaircare.com/tutorials.htmlSECURE FASTENING - DO NOT INSTALL WITHOUT SLEEVE! Featherlight sleeves protect and secure the winding of hair around the rollers. The nylon, net-like fabric of the sleeves safely and securely attaches to the gripping hooks of the rollers. If the net covers the majority of the outer surface of the rollers, the hair does not shift position even during physical activity or overnight wear. This entry was posted in Hair Care on February 26, 2017 by admin.